GIS Cloud Geocoder is a fast and simple, but effective tool that enables you to easily translate an address into coordinates and represent data on the map. GIS Cloud Geocoder is in beta faze and available only for Beta customers. For more info and assigning geocoding credits, please contact us at info@giscloud.com. It is necessary to arrange data in the way the system can recognize it. 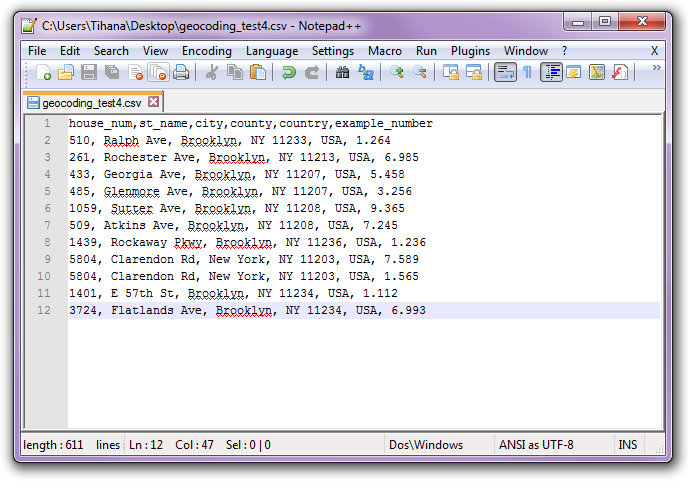 Only XLS and CSV are supported formats for geocoding. Make sure that table does not have complex formatting (merged cells, double header, more sheets, font color etc.). Export your table as .csv and open table in common text editor (e.g. Notepad++). Make sure that the column separator is comma (,) and not semicolon (;). In the first row (header) has to be column title and all other rows have to contain data. Header must not contain any spaces. For the header use only English alphabet letters, digits and underscores (_). The table has to have UTF-8 encoding. 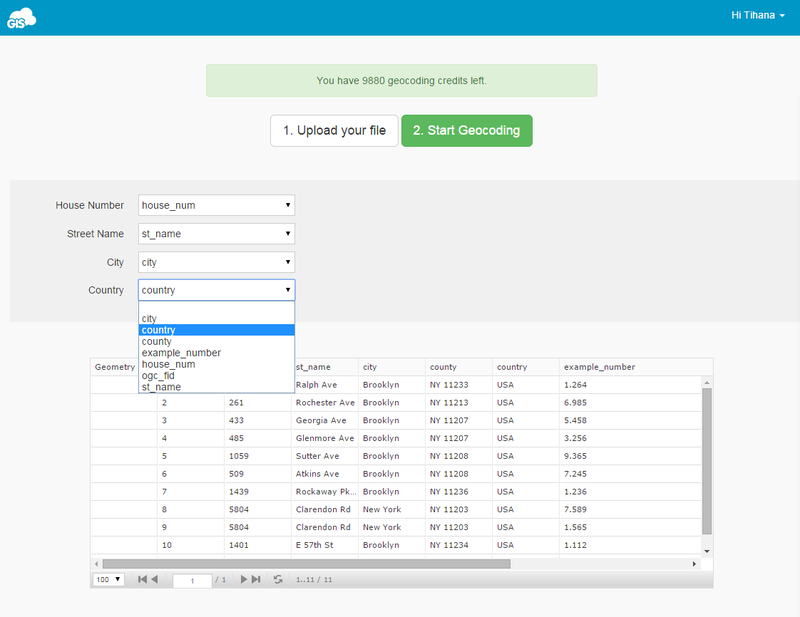 Open geocoding.giscloud.com and login with your GIS Cloud credentials. Drag and drop a file or select the file from the File Manager. Browse file and click Select button. Match all address fields (e.g. house number with house_number column, street name with street_name column etc.). 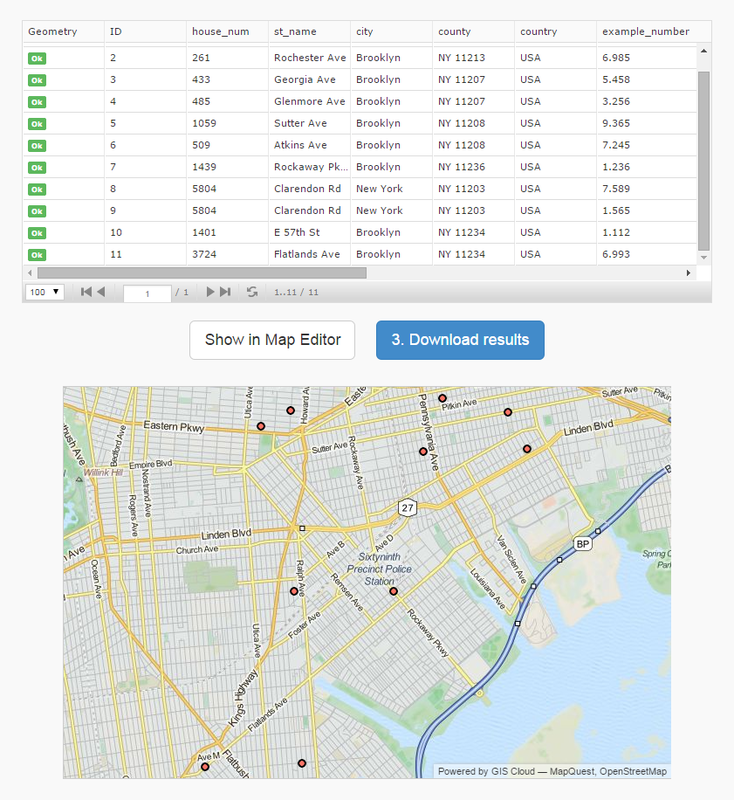 You can see the results in Map Editor or download the layer with geocoded data.